Moog Animatics presents webinars that provide in-depth content on a specific product, feature or technology. Review the webinar information below and then click the desired link to register and view the prerecorded presentation. 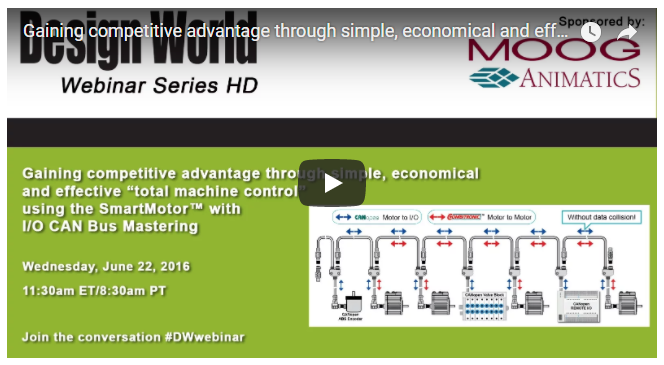 In this webinar, you will learn how employing fully integrated motion control systems such as Moog Animatics’ SmartMotor™ can make machines quicker to replicate, reduce machine footprint, eliminate control cabinets and reduce cabling costs. 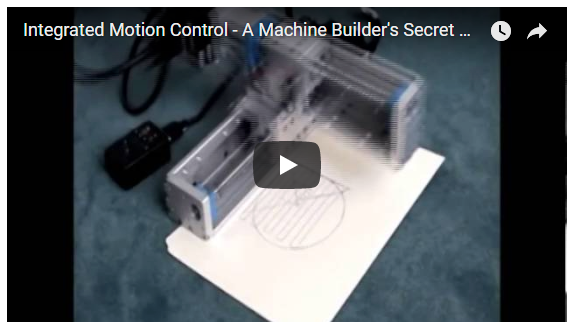 In addition, in-depth coverage of multi-axis machines and their applications will show you how fully integrated motion control systems can be programmed before the machine is even built and how to ease the pain of adding additional axes. Click here to register and view the webinar. Imagine being able to control an entire machine, simply, economically, and effectively, without need for an external bus master – that dream is now a reality. Moog Animatics recently announced the release of its new I/O Device CAN Bus Master capability. This extension of previous I/O support enables the Class 5 SmartMotor™ to interface with standard CiA 301 CANopen® devices. Further, multiple SmartMotors and multiple I/O devices may be on the same CAN bus. When combined with Combitronic™ motor-to-motor communications, this allows for complex, multi-axis, multi-I/O-device network control.